In increasing numbers, American Christians have come to realize that the ethos and ends of the American government often undermine Christianity and its institutions. Like other Western, secular states, the United States now seems antagonistic to religious institutions, threatening their capacity to form their members and to engage in the practices they need to grow and flourish. It seems more plausible now than in the recent past that Church and state will be locked in a long struggle. Christians, however, have too often failed to recognize that we’re frequently swayed by the deep, romantic national identity that America fosters so well in its citizens. It and not the Church often sets the agenda. The calls for religious freedom very quickly focus on the rights of conscience, reinforcing an individualism that downplays the importance of the freedom of the Church to occupy public space on her own terms. In response to the government’s decision to force Catholic institutions to comply with the new health care law, for example, one might have hoped for a strong, prophetic, and theologically serious response from a Catholic leadership that feels especially besieged by the Affordable Care Act. Instead, the United States Conference of Catholic Bishops gave us the feeble “Fortnight for Freedom.” In name (“Freedom”), time (concluding on Independence Day), and icon (the Statue of Liberty), the USCCB merged American mythology with Christian history. The bishops’ rhetoric suggested no inherent incompatibility between being American and following the gospel. If the new health care law were only more American, there would be no need to protest. We need to use more than the weapons of modern political culture—the language of rights, for example—to make a cogent defense of the Church. Christians need to understand—on the Church’s terms, not the world’s—the challenges they face. Discipleship makes claims on the follower that differ from those made by the nation on the citizen. This is a lesson taught by the Catholic understanding of papal primacy and, perhaps unexpectedly, of clerical celibacy. It is to be further considered that the mind cannot be in a condition for pursuing the most noble of studies unless it is entirely free from vice, not only because there can be no communion of good and evil in the same breast, and to meditate at once on the best things and the worst is no more in the power of the same mind than it is possible for the same man to be at once virtuous and vicious, 5. but also because a mind intent on so arduous a study should be exempt from all other cares, even such as are unconnected with vice. For then, and then only, when it is free and master of itself, and when no other object harasses and distracts its attention, will it be able to keep in view the end to which it is devoted. 6. But if an inordinate attention to an estate, a too anxious pursuit of wealth, indulgence in the pleasures of hunting, and the devotion of our days to public spectacles rob our studies of much of our time (for whatever time is given to one thing is lost to another), what effect must we suppose that ambition, avarice, and envy will produce, whose excitements are so violent as even to disturb our sleep and our dreams? 7. Nothing indeed is so preoccupied, so unsettled, so torn and lacerated with such numerous and various passions as a bad mind, for when it intends evil, it is agitated with hope, care, and anxiety, and when it has attained the object of its wickedness, it is tormented with uneasiness, repentance, and the dread of every kind of punishment. Among such disquietudes, what place is there for study or any rational pursuit? No more certainly than there is for corn in a field overrun with thorns and brambles. via Book 12 – Chapter 1: Quintilian’s Institutes of Oratory. No small irony appears just here, in this unintended Eutychianism that obscures the humanity of Christ! And it has its own inevitable consequences for ecclesiology, as we must now observe, for it tends also to obscure the Marian and Petrine dimensions of the Church. It tends, that is, to occasionalism. via Gonzaga University: Catholics Need Not Apply?. Regarding abortion, the ERDs restate the universal and consistent teaching of the Catholic Church on defending the life of the unborn child—a defense that, as Pope Francis recently reminded us, “is closely linked to the defense of each and every other human right” (Evangelii Gaudium, no. 213). This same commitment to the life of each human individual has motivated Catholics to establish the nation’s largest network of nonprofit health care ministries. These ministries provide high-quality care to women and children, including those who lack health coverage and financial resources. The Church’s rejection of abortion also mirrors the Hippocratic Oath that gave rise to the very idea of medicine as a profession, a calling with its own life-affirming moral code. via He’s No Secular Saint: The Trojan Pope | TIME.com. Here I shall cite only John XXIII’s well-known words, which unequivocally express this hermeneutic when he says that the Council wishes ‘to transmit the doctrine, pure and integral, without any attenuation or distortion.’ And he continues: ‘Our duty is not only to guard this precious treasure, as if we were concerned only with antiquity, but to dedicate ourselves with an earnest will and without fear to that work which our era demands of us ….’ It is necessary that ‘adherence to all the teaching of the Church in its entirety and preciseness …’ be presented in ‘faithful and perfect conformity to the authentic doctrine, which, however, should be studied and expounded through the methods of research and through the literary forms of modern thought. The substance of the ancient doctrine of the deposit of faith is one thing, and the way in which it is presented is another …,’ retaining the same meaning and message. via New Liturgical Movement: The Ongoing Saga of “the Hermeneutic of Continuity”. The socio-cultural context in which you are placed is sometimes weighed down by mediocrity and boredom. We must not resign ourselves to the monotony of everyday life, but cultivate large-scale projects, going beyond the ordinary: don’t let your youthful enthusiasm be stolen! 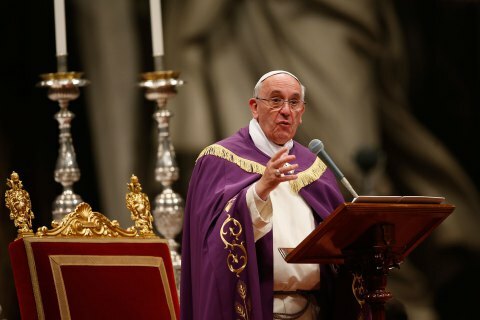 via Be counter-cultural, Pope encourages university students :: The Roman Catholic Diocese of Tulsa (Tulsa, OK). Eundem quidem Spiritum exaudiens, Sancta Ecclesia huius temporis amplissimam Tridentinam doctrinam etiamnum redintegrat et meditatur. Etenim “interpretatio renovationis” quam Praedecessor Noster Benedictus XVI anno MMV coram Curia Romana explicavit haud minus ad Tridentinum quam ad Vaticanum Concilium refert. Enimvero hic modus interpretandi nitidiore sub luce ponit unam praeclaram Ecclesiae proprietatem quam Ipse Dominus illi impertitur: “Ea videlicet est unum `subiectum’ quod, saeculis decurrentibus, crescit ac augetur attamen semper idem manet. Ea itaque est unum subiectum peregrinantis Populi Dei” (Sermo ad Curiam Romanam Natali in tempore Domini). Ideo gaudemus et laetamur quod, tanto decore in historia Ecclesiae enitens, hic eventus sollemniore modo in Tridenti urbe celebratur. via LETTERA DEL SANTO PADRE ALL’INVIATO SPECIALE ALLE CELEBRAZIONI DEL 450° ANNIVERSARIO DELLA CHIUSURA DEL CONCILIO ECUMENICO DI TRENTO (TRENTO, 1° DICEMBRE 2013). via Monday of the First Week of Advent. If for no other reason, then consider this: for more of us than you think, the difference between joy–real joy, what Lewis calls “the desire to continue” and what moved Henry van Dyke to call Christ “Wellspring of the joy of living, / Ocean’s depth of happy rest”–and an oppressive, cloying, constantly faked happy-clappy-ness can only be felt in the self-exhaustion of penance. Taxed to “rejoice” in unbroken happiness, we stumble near despair. This world is simply not good enough to make us that happy, and to constantly pretend that God is immanently or imminently translating us into the Eschaton means to constantly cycle between delusion and disillusionment. Those who God has graced with the privilege or the ability to routinely experience happiness, we cheer on with bewildered eyes–but more often we notice the false consciousness, the doubtful props, the denials and evasions, by which many adequate their experience to their emotional needs. Give us, though, a season for exhausting ourselves–for watching our own separation from facile happy-making grow, for becoming hungry for the simple graces and mundane joys, for insisting that these come with Jesus, with the sacraments and the blessing of the Church, or not at all–and we despair of our manufactured wish-fulfillment fantasies, and hope in Him; we are worn out with struggle, and find rest; famished, we feast. Two other reasons spring to mind as to why we find it worthwhile to read St. John Damascene. First, he is noted for declaring and defending Mary’s title as the “Mother of God,” the Theotokos. This is a very rich topic and very important for the Church in our times. St. John goes so far as to say that when we call Mary “Mother of God,” we express the whole truth about who Jesus Christ is. Secondly, it is important for our students to meet — and in some way savor — the richness of the East. The split between the East and the West is one of the great tragedies of Church history. 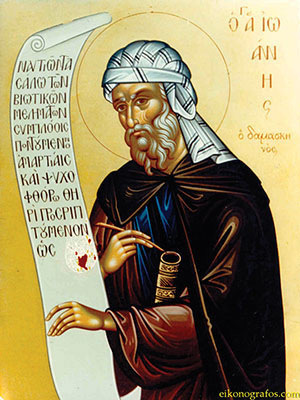 In reading St. John Damascene, our students taste this richness of Eastern thought in a way that calls out for unity, in a way that points out the fundamental unity of doctrine in the whole Church. via Defending Damascene | Thomas Aquinas College. John Paul II, Ex Corde Ecclesiae 8.